The West Mine is by far the biggest mine on Alderley Edge, the main workings being carried out at the same time as those at Wood Mine, 1857 - 1877, by the Alderley Edge Mining Company. It is probable that this area was mined previous to these dates as possible evidence of fire setting was found whilst excavating the opencast during 1858. During the main working period from 1857 to 1877, West Mine was probably known as the Western Mine and was worked in two sections divided by a fault or Great Slide. Ore was extracted by a railway hauled from the surface using a rope. Ventilation was achieved by the use of two air shafts at the middle and far end of the mine. After the voluntary liquidation of the Alderley Edge Mining company in 1878 the mine had various spells of activity. In April 1909 rumours abounded that the mine was about to be opened again, in a newspaper article of July 1909 it was reported that samples of ore taken from the mine had proved to be "highly satisfactory". In February 1911 it was reported that work had commenced to re-open the mine but nothing much came of it and by 1913 the mine was closed again. In January of 1914 a Mr A Gibb of London was reported to have taken over the copper mines from Lord Stanley, in 1915 he prosecuted two youths for damaging a gate at the copper mines, each was fined five shillings (25p). By the end of 1916 the mine was closed again when Mr Gibb took up an army commission. Work was re-started in early 1918 by Alderley Copper Limited, the explosives licence was renewed in March that year, but by early June of 1919 the mine was reported to have closed yet again. The mine was finally abandoned in 1923. 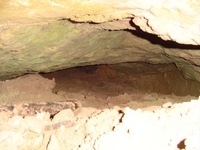 Despite the short period of re-opening, evidence in the mine shows that a number of passages were mined using high explosives. 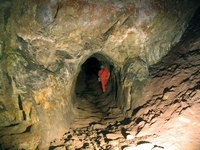 The entrance to the mine was marked by a large opencast quarry with a huge gaping entrance to the underground workings, the entrance stope seeming to be cathedral like in its proportions, with galleries high in the roof and passages opening out to sheer drops it is not surprising that this mine is the most notorious on Alderley Edge for its accidents, some fatal. The mine entrance was eventually sealed and the opencast filled in during the late 1950's and early 60's. There are two entrances both dug by the DCC. Access is by arrangement with the owner of the old entrance, Mr P.V.R. Sorensen, or through the DCC on behalf of the National Trust who own the new entrance. The owner of the majority of the mine who lives at White Barn Farm has also given his consent to our access. West Mine consists of a series of large tunnels on three levels following the dip down towards the WSW and then turning NW on the strike towards the end of the mine. The description is of the main route only. The original entrance is buried. The old entrance is a hinged steel cover. Fixed ladders lead to the Main Chamber. This can be followed to an end after 140m. The main branch (The Canyon) leads off on the south side after about 90m. Above and to the north area series of older, smaller passages known as the Roman Galleries where the new route into the mine enters. These can be reached from the N side by a climb after 100m or by a climb on the opposite side and cross-over passage. Following on down the Canyon leads past a junction (E side) at 50m where the Railway Tunnel enters. This is a short-cut back to the entrance. At this junction, a passage leads S into Twisted Pillar Cavern while the main passage continues SW to Sphinx Chamber. The Sphinx was a prominent rock that was vandalised in the 1950's. Above this route is another large stope reached from the Cavern of the Twisted Pillar and ending in a covered shaft to surface above Sphinx Chamber. The mine is cut in two after Sphinx Chamber by a major N-S fault. At Sphinx Chamber a short climb (fixed ladder and chain) leads to a steep incline up to the bridge across the infamous Plank Shaft. From here two routes can be followed that converge on the Great Arroyo, the first large stope after Plank Shaft. At the end of the Great Arroyo which runs NE-SW, a second fault is met and the mine turns NW again. At this point is Chain Shaft, an inclined shaft on a fault, connecting all levels. When the mine was working, a railway level led from the Sphinx Chamber, through the bottom of Plank Shaft and Chain Shaft to the end of the mine. 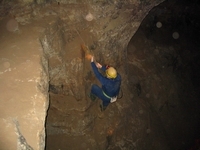 This level is partly flooded and accessible from Chain Shaft and the Bottom Level (see below). A by-pass to Chain Shaft leads round the W side of it. Chain Shaft can be climbed upwards with the use of a fixed chain to the Top Level and downwards (10m ladder required) to the railway level. 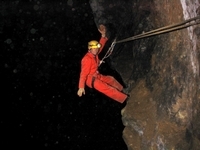 From the top of Chain Shaft, the Top Level can be followed to the NW limit of the mine. 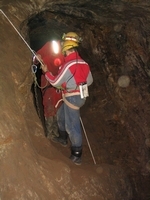 Below this and connected to the Top Level at Chain Shaft and 200m further along is the Middle Level route to the end of the mine including a traverse over Springboard Caverns. The next level down is straight across Chain Shaft and joins the old railway level after a gentle slope down. Just after joining the railway level is a prominent rock known as The Dog or The Lion. From here, access is possible by some easy climbs and devious routes to the Middle and Top levels. 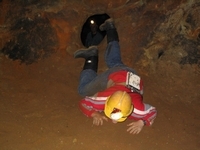 The Bottom Level can also be followed to the stopes at the NW end of the mine. At 100m before the end, a branch leads W below Doctor's Shaft to a steep incline up to the Top Level. There are a number of branch tunnels on the NE side of the three main levels in the further part of the mine. 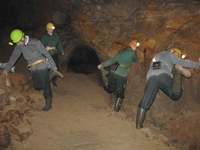 The mine is entered today via shafts dug by the Derbyshire Caving Club in 1975 and 2002. Access to the mine is limited to members of the DCC and to other clubs and individuals who are insured by BCRA/DCA/BCA. Temporary membership is available for this purpose. This arrangement is to ensure that the landowners above the mine are indemnified. Go to the main photo gallery for more pictures of West Mine. 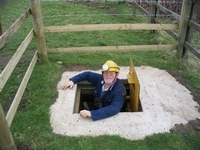 New entrance in 18 acre field It's wet in some of the passages Look no hands! 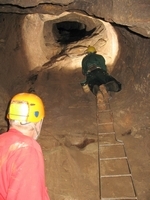 Looking up Doctor's Shaft with Tom on the ladder.